Laurie McDonald attended the Rhode Island School of Design in the early 1970s to study photography with Harry Callahan and Aaron Siskind. When they neglected to show up for class with any regularity, Laurie’s focus was diverted to video, at that time an incipient art form, and recognized video as a means to combine her various creative interests which included film, photography, music, dance, and painting. Two years later, she and three other classmates were awarded fellowships from the National Center for Experiments in Television, an affiliate of KQED-TV in San Francisco, and were in-residence at the NCET facility experimenting with the latest in video and audio processing tools. 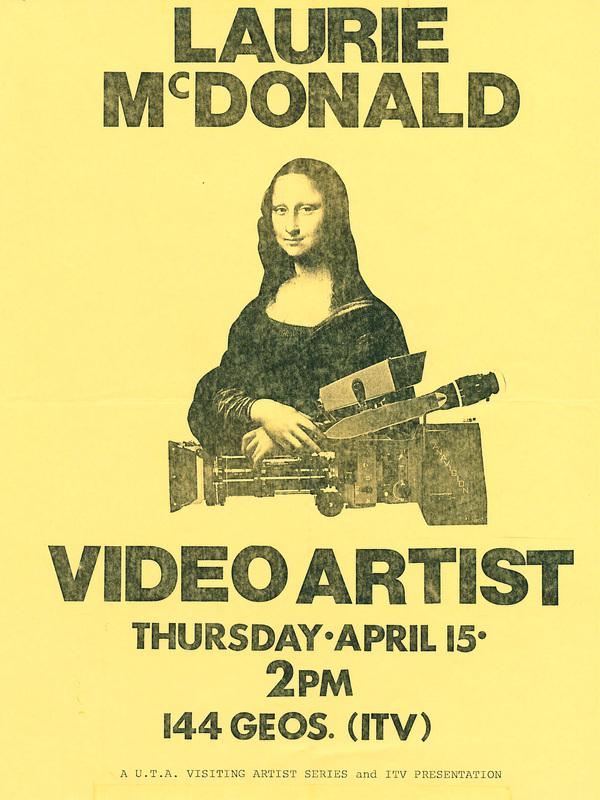 She was a founding member of Electron Movers, Research in the Electronic Arts, Inc., a Providence-based video collective in existence from 1974 through 1979 and active throughout New York and New England. Also during that time she was a member of the corps de ballet of a Rhode Island ballet company that supplied dancers to the local opera company. In early 1980, Laurie relocated to Houston, Texas, where she was Video Projects Director for the Southwest Alternate Media Project. Laurie developed an on-going relationship with the conservation department of Houston museum the Menil Collection and, in collaboration with the Whitney Museum of American Art and Harvard's Center for the Technical Study of Modern Art, built a body of work known as the Artists Documentation Program (http://adp.menil.org/). In 2005, Laurie moved to Santa Fe, New Mexico, to live in a place with four seasons and mud houses. ​Laurie McDonald is the recipient of a National Endowment for the Arts Visual Artist Fellowship, four American Film Institute/NEA Fellowships and was twice-nominated for the Alpert Award in the Arts from CalArts, Los Angeles. Her video work has been exhibited in museums, galleries, and festivals nationally and internationally including the Museum of Modern Art, the Metropolitan Museum of Art, the School of the Art Institute of Chicago, the Festival du Cinema, the Tokyo Video Festival, and the Gallery of Modern Art in Rome. In addition to a BFA in film and video from the Rhode Island School of Design, she holds an MA in Literature from the University of Houston and is a member of Sigma Tau Delta, the International English Honor Society. In 2018, Laurie McDonald, writing as Eva Rome, published the book Travel for STOICs: Empowering the Solo Traveler Who is Obsessive, Introverted, and Compulsive. For more information, visit: www.travelforstoics.com. Laurie is also a sound therapist, holding certifications from the Nada Centre for Music Therapy, New Delhi/Chennai, India, where she is also an honorary faculty member, and the Acutonics Institute of Integrative Medicine in New Mexico. Please visit her sound therapy Web site at: www.soundtherapysantafe.com.